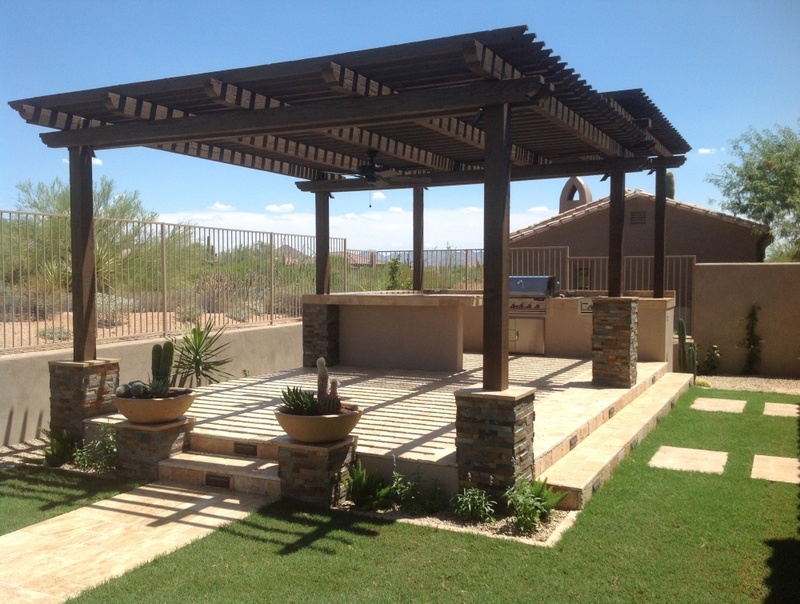 You want more than a shade roof - Scottsdale patio assets. If you’re going to have a truly great outdoor living space in your backyard, make sure the plans include lots of assets, like this gorgeous wood shade roof. Scottsdale natives call this style a ramada, but if it’s a pergola to you, that works too. A pergola or ramada normally has a flat roof, but there’s no reason they can’t be designed with more interest, but when you do something unusual, you have to follow the basic principles of architecture. The step down could have been created at several points along the span of the roof, but not all of them make sense. Placing the drop where the invisible wall between outdoor kitchen and outdoor dining room would be adds to illusion of two separate functional spaces, yet the only thing separating them is a bar counter. While not really part of this Scottsdale shade roof’s design, the floor being raised two steps above ground level also sets this part of the overall outdoor living plan apart from everything else that’s going on in this backyard. It’s a little ways from the pool, but has full view of everything that’s going on there. Something that should have homeowner’s with youngsters full attention. This shaded space gives adults a place to have a conversation while keeping an eye on the kids in the pool. But it’s designed in a way that is appealing to anyone. The ramada flooring and lighted steps are done in travertine pavers. The roof support pedestals are faced in Sierra Blend natural stone, which pulls the light stone paver tones and the dark rich wood overhead in the shade structure together very nicely. To keep the dining area as pleasant as possible, a large outdoor ceiling fan. If you look closely at the larger image below, you will see that there are lights on the inside of every post to give the homeowners full use of their new outdoor space after sundown.